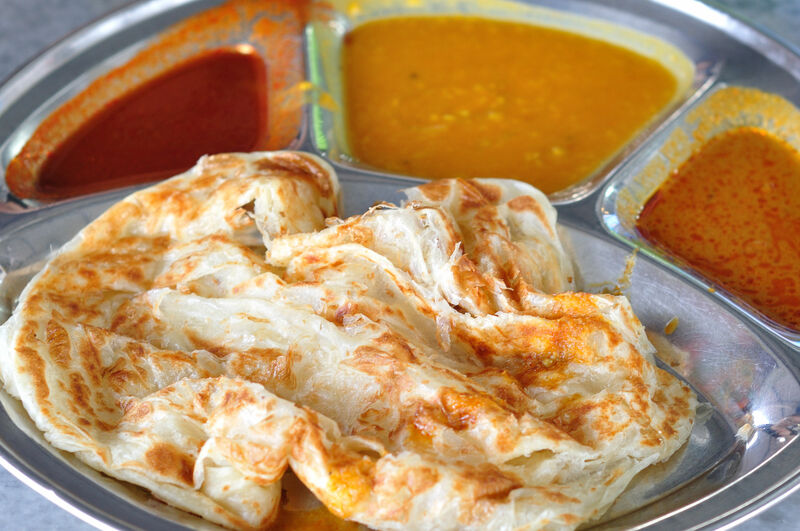 Roti Canai is an all-time Malaysian favourite that is best eaten piping hot with any of your favourite curry. Recipe and photo courtesy of Chef Bhuvaneswaran Surendran. Combine flour, salt and sugar in a large mixing bowl. Make a well at the centre of the dry ingredients and add the water, condensed milk, margarine and egg. Work in a circular motion with your hand, gradually gathering more and more of the flour into the wet ingredients until you more or less have a single mass. Tip all the ingredients onto the kitchen table and knead until smooth and elastic. Roll into a cylinder and divide the dough into ten pieces. Knead each piece a few times to achieve a smooth texture, then shape into a ball. Gently cover each ball with margarine and rest in a bowl alongside but not on top of one another. Plastic wrap and allow to rest at room temperature, overnight. After resting the dough overnight, you will find the dough soft and stretchy. Start by oiling a substantial area of the table liberally. Place one dough ball onto the table and press down with the palm of your hand while moving it in a circular motion. This is just to flatten and smoothen out the surface of the dough as much as possible before you stretch it. It takes a bit of practice to throw the roti the professional way. While it’s definitely quicker, an equally effective method is to work around the edges of the circle of the dough by gently stretching the edges outwards as far and as thinly as you can (so it is like tracing paper and about 60 to 70 centimetres in diameter), and before holes start to appear. Fold one-third of the way in on either side of the circle, so you have three layers of roti on top of each other, then fold this elongated shape into thirds again, so you end up with a squarish-shaped roti. Heat up your fry pan on high heat with a dash of vegetable oil and pan-fry the roti until golden blisters appear on both sides. When cooked, immediately slide the roti onto a chopping board, wrap you palms around the edges and smash your hands together so the roti bunches up and flakes. Rotate the roti and do this several times while it is still hot. Now it is ready to be served piping hot with your favourite curry. Recipe for Curry, that goes with Roti ? I live in Mauritius and a big fan of Malaysian food. I have tried the famous roti canai and have been able to make the dough quite elastic but the main issue I have is that once I start to stretch the dough and throw the dough it tends to break and create holes in the middle. Can you help me on how I can prevent this from happening ? How about roti planta and Roti tissue? Any recipes?